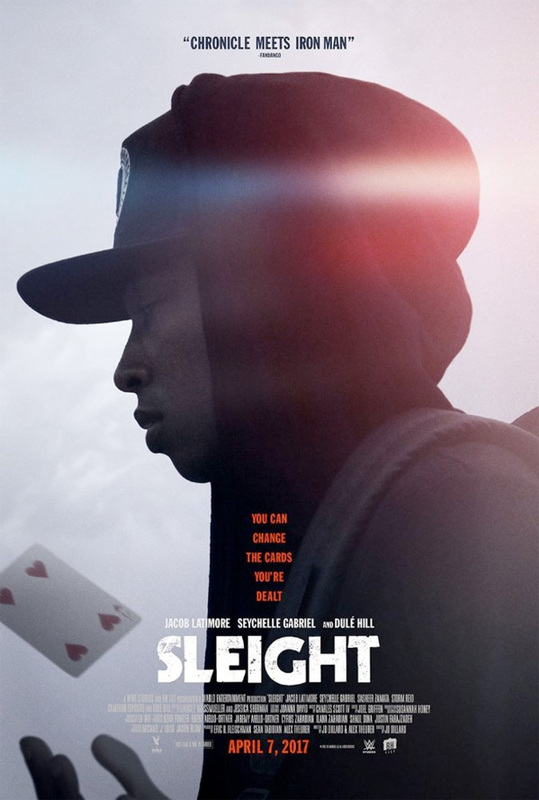 "I can do something no one else can…" Blumhouse Tilt has released a brand new, full-length official trailer for an indie film titled Sleight, which premiered in the ultra-low budget Nexst section of the Sundance Film Festival last year. Sleight is about a street magician in Los Angeles who gives himself superpowers and takes on a local drug dealer to save his sister. Jacob Latimore plays Bo, with a full cast featuring Seychelle Gabriel, Dulé Hill, Storm Reid, Sasheer Zamata, Michael Villar, Brandon Johnson & Cameron Esposito. I wrote in my review "it's a fairly simple story, but the film is still awesome." I highly recommend seeing this film, mostly to support talented young directors and shoestring budget filmmaking. Check it out. You can still see the first teaser trailer for Sleight here, to compare footage from these trailers. A young street magician is left to take care of his little sister after his mother's passing and turns to drug dealing in the Los Angeles party scene to keep a roof over their heads. When he gets into trouble with his supplier, his sister is kidnapped and he is forced to rely on both his sleight of hand and brilliant mind to save her. Sleight is both written and directed by young filmmaker J.D. Dillard, making his feature directorial debut after working in the kitchen at J.J. Abrams' Bad Robot. The screenplay is by Alex Theurer and J.D. Dillard. This first premiered at the Sundance Film Festival in early 2016. BH Tilt will be releasing Sleight in select theaters starting J.D. Dillard's April 7th, 2017 next spring. Highly recommend seeing this. Looks good. He should be looking for that "pengest munch"~~~~~~~~~. Thank you for this post, Bo! First of all, thank you for recommending those two books. To be honest, I found more interesting the first one, Ernest Becker's The Denial of Death (and especially, for the reasons of influence that helped him to articulate his views, one of them being that Danish philosopher Søren Kierkegaard from 19th century that I have strong respect for).However, the second one is probably also good, I believe in your choice. But I have also to add, I read a lot of things about those matters we are talking about here. And I like coming across many new and good book titles. So, yes, at some point, Ernest Decker's book is gonna find its place in my reading itinerary first and Tolle's one will have to wait for a while. As for my reading of the books, generally, I am writing the doctorate right now, so a lot of literature I read at this point has very determined purpose (and even films sometimes) and I choose very carefully these days what will I read. At a moment, it's Freud and his Interpretation of Dreams and works from French philosopher Paul Ricouer. Heavy stuff for some (or most) film lovers, I guess. But you can imagine that those people do tackle some of the things we discuss here. I really like what you are saying about the films. I mean, being in a film business and having such an awareness about the influence films have on the general population means that you have done very much about your sensibility, regarding cinematic and existential situation and that describes you in a good way, as expected, anyway. Which also makes one to appreciate more the living and creative situation you are working in are surrounded by. Or that's where you were, I guess. Yes, I am very, as you say, ripe for all those things, since those things define ourselves in many respects. And yes, I see a lot of people not being aware of those influential means of deception and I also am trying to do just the opposite. And, one more time, yes, I openly accept the awareness and I tend to think that being aware of cultural, social and historical environment is one of those substantial things I have to develop and work on (by the way, I write philosophical articles and lately, a book). Like you are doing that, I guess, from your perspective. Keep enjoying your life, Bo, it looks like you know what it means to be and what is there in it to have the meaning for you. Cheers.